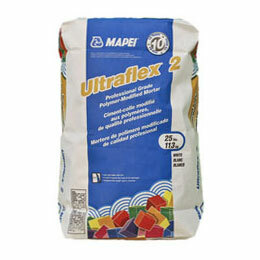 Mapei Ultraflex 2 (white) is a professional-grade, single-component, high-performance, polymer-modified thin-set mortar for interior and exterior installations of ceramic, porcelain and dimensional natural-stone tile. This mortar has a high content of unique dry polymer, resulting in excellent adhesion to the substrate and tile. Ultraflex 2 meets or exceeds ANSI A118.4 and ANSI A118.11 requirements when mixed with water. Ultraflex 2 can be used for interior and exterior installations of tile in most residential floor and wall applications. In commercial applications, use on interior floor and wall installations and exterior floors. • Do not use for moisture-sensitive stone (green marble, some limestones and granites), agglomerate tiles or resin-backed tiles. Instead, use a suitable epoxy or urethane adhesive. See the respective Technical Data Sheet for more information. • Do not use over dimensionally unstable substrates such as hardwood flooring, oriented strand board (OSB), substrates containing asbestos, or metal. See the “Suitable Substrates” section. • To use directly over gypsum-based patching or leveling substrates, apply suitable primer before use. See MAPEI Technical Bulletin 010313-TB, "Gypsum-Based Floors and Walls: Which MAPEI Products Can Be Applied? ".